TMS Sustainability E-News is produced two times monthly to keep TMS Members and others interested in sustainable design informed of new trends and products, and how masonry can assist in making the built environment more sustainable. 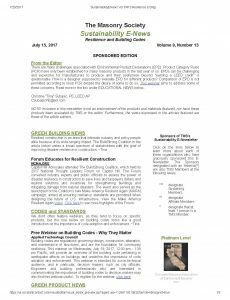 The Masonry Society is offering sponsorships for the popular Sustainability E-Newsletter. Click here for more information about sponsorships. Funding for the Sustainability E-News is provided by the sponsors listed below.